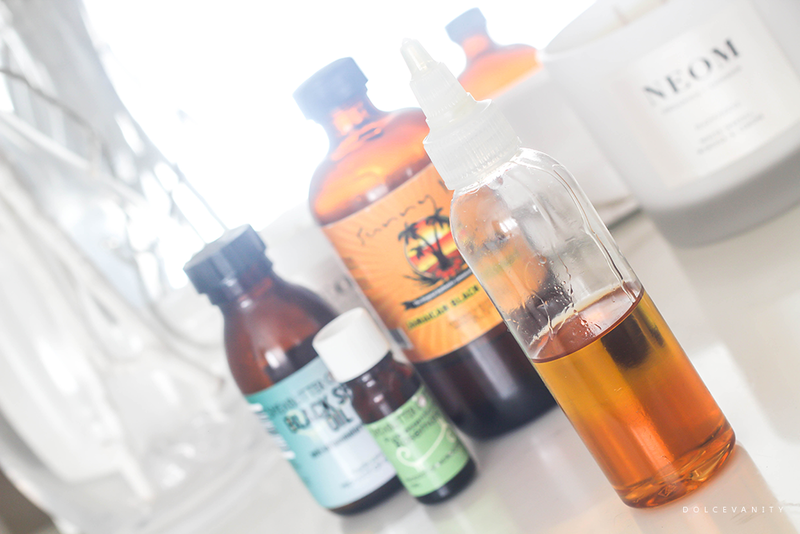 Growing up, greasing the scalp was just as important as anything else in the haircare routine. A few weeks ago a stranger stopped me to talk about my hair, I had simply washed my hair the night before, wasn't feeling the results and it went into a loose top bun. She asked if it was my natural hair colour and after an explanation that from my roots until 3/4 of the way down it was. She complimented my hair and asked what I do to my hair, I began to tell her that I try to keep it simple but I use a lot of oils and I told her about Sheabutter Cottage where I get the majority of my ingredients for my hair D.I.Ys. I told her how at least 3x a week I will grease my scalp and also seal my ends with one mixture I've used since about last October I've been using an oil blend for the scalp using the following oils, black castor oil, black seed oil and rosemary essential oil. Black Seed Oil is an anti-inflammatory it'll help soothe any irritations, flaking and sensitivity. Also it kills viruses and fungal infections while encourages hair growth and helps against hair loss. I also read that "It can also fix hair that has been badly damaged either by styling or coloring. Damaged hair can grow back healthy and shiny from the roots down." Black Castor Oil is another that'll help promote hair growth and help to thicken the hair. Rosemary is also another stimulant for hair growth but at the same time it'll turn down that burnt smell that can be present in the castor oil. 1/2 cup castor seed oil. 1/4 cup black seed oil. Peppermint oil is optional sometimes I may add it to the blend also but will do about 10 drops. Mix all into an applicator bottle, give it a little shake & it's ready to use. As previously stated I've used it since October and I've trimmed my hair where needed but I've had remarks that my hair looks to of been growing but I'm more concerned also on the conditioning of my hair and getting more thickness. I have fine hair but a lot of it. My ends at the moment need the most care and attention.